SunRiver St. George is a gorgeous 55+ community located on the outskirts of scenic St. George, the largest town in southern Utah. This mountain view community offers well-built single-family homes and numerous amenities as well as dozens of activities. Residents of SunRiver at St. George enjoy the 18-hole champion golf course, a state-of-the-art fitness center, beautiful swimming pools, outdoor sport courts, walking paths and much more. The mild temperatures and natural beauty of the surrounding area makes SunRiver St. George a popular retirement destinations for active adults. SunRiver St. George is the perfect place for residents to gather with friends and neighbors. The large clubhouse has the NewLife Fitness Center complete with workout equipment, an aerobics studio and indoor swimming pool. The full time activities director at SunRiver at St. George designs programs to get everyone involved at a comfortable level of fitness. SunRiver at St. Georges clubhouse hosts numerous activities for residents such as book club, chess club, computer club, theater and more. A large ballroom is used for square dancing, jazz dancing and round dancing. The hobby and game room has bingo, carving, a woodshop, crafts, painting and scrap booking and many other activities. The mild weather is perfect for year round games on the pickle ball courts, shuffleboard courts, lawn bowling and tennis courts. 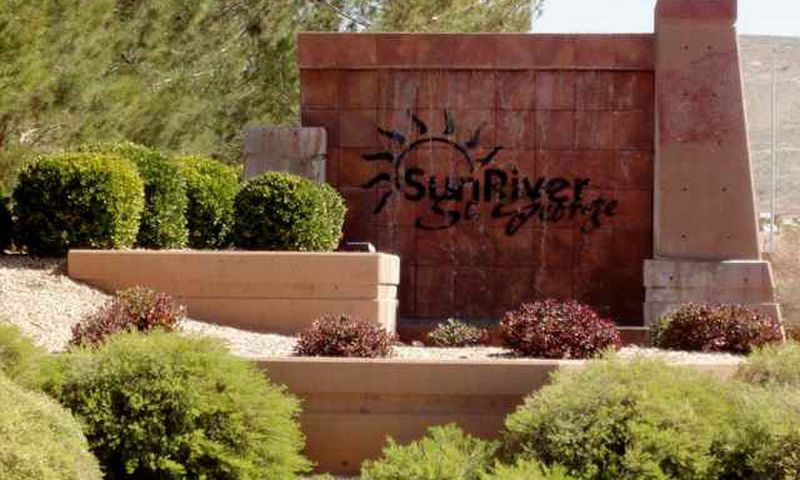 Residents receive a preferred rate at the SunRiver St. George 18-hole golf course. The impressive 5,500 square-foot golf clubhouse accommodates golfers at every level. The Riverwalk Grill, located at the SunRiver Golf Club, provides residents with a breathtaking view of Pine Valley Mountain. It's the perfect spot for a quick lunch between holes or a lovely dinner in the evening. In addition to the fabulous 35,000 square-foot clubhouse, residents of the gated Reflections neighborhood enjoy a private clubhouse of their very own. This small facility includes a multi-purpose room that's the perfect spot to host a party. Also included is an exercise room and resort-style adore pool, making staying fit and active a breeze. Construction of SunRiver St. George began in 1998 and the community will contain 2,300 homes upon completion. SunRiver is comprised of well-constructed single-family homes ranging in size from 1,008 to 3,184 square feet. There is a wide range of prices of these new and resale homes. Homebuyers will find reasonably priced ranch-style homes with over twenty floor plans available. Those looking for the same low-maintenance single-story homes with more privacy can find a home in the private gated neighborhood of Reflections at SunRiver St. George. The developer, Darcy Stewart, designed these quality homes with optional spaces such as extended garages, patios, and flex space where buyers can customize their homes to fit their lifestyle. Some homes include a three car garage and one phase of the community is gated. Many of the homes feature a spectacular view of Pine Valley Mountain, the golf course or the open desert. Some homes even have a view all the way to Zion National Park, one of the most beautiful parks in the area. Residents will find SunRiver at St. George the perfect place to enjoy active retirement living at its finest. The beautifully maintained community allows residents diverse social activities, classes, and recreational opportunities all year round. The large clubhouse features a state-of-the-art fitness center, hobby and game rooms and a beautiful ballroom. Tennis courts, pickleball courts, bocce ball courts, swimming and scenic walkways provide active adults recreational opportunities every day of the week. The scenic SunRiver at St. George golf course sits next to the Virgin River with the beautiful desert terrain in the surrounding area. The hot summers and mild, snowless winters in SunRiver at St. George allow year round golf games. SunRiver at St. George is located in one of Utah's fastest growing areas. Situated just off 1-15, this active adult community is a short distance to eight national and state parks, including the Grand Canyon. Las Vegas is a mere 120 miles southwest of SunRiver at St. George. This beautiful adult community is just five miles from downtown St. George, a sun drenched southwestern town, nestled between red bluffs to the north and the Mojave Desert to the south. St. George has large shopping areas, a municipal airport, houses of worship and medical facilities. St. George is surrounded by mountains and sandstone buttes on the northeastern edge of the Mojave Desert. The Virgin River and Santa Clara River meet on the southeastern side of the city and the Virgin River runs right through the center of St. George. There are also three large reservoirs which double as parks and marinas for fishing, water skiing and boating. Residents of SunRiver St. George welcome new neighbors in a vibrant community with all their daily needs in one area. SunRiver Community Center - 35,000 Sq. Ft.
Reflections, a gated neighborhood within SunRiver St. George, includes amenities that are available exclusively Reflections' homeowners. There are plenty of activities available in SunRiver St. George. Here is a sample of some of the clubs, activities and classes offered here. There are over 20 models available throughout SunRiver St. George. Homebuyers can select a new or resale home that has between 1,008 and 3,184 square feet of living space. These single-family homes have one to four bedrooms, two to three bedrooms, and an attached two to three-car garage. When we first moved to Sun River we had no idea just how wonderful it would be. We have made the best possible friends, and feel like we're in our forever home. We also enjoy the numerous activities, from pickle ball to photography, golf, hiking, live entertainment, and so much more. What a great place to live! I wish this review could be more positive. We chose Sun River 2 years ago, hoping that this would be our forever home. Now we're not so sure. There is a tremendous amount of contention here between residents and the developer. What makes residents unhappy? There's only one average size clubhouse for 2,400 homes. Even though some prospective owners were told there would be a 2nd clubhouse, there appear to be no plans for one. Residents are often excluded from "sold out" events held in the ballroom, which is now too small for this number of homes. Owners all too often find themselves waiting for equipment at the gym or time on the tennis and pickleball courts during peak hours. The dog park, an important amenity for many residents, is very poorly maintained, and the management company is threatening to close it down due to a nearby homeowner's complaints about barking. There are serious transparency issues being brought up about the management company, which is operated by the developer. There is no security service provided for the community even though it is not gated for privacy. And, the landscapers are deemed totally useless by way too many homeowners. A 5-story hotel is being built on property adjacent to Sun River homes. The hotel will take away privacy for homeowners living nearby. The developer could have opted for a 3-story hotel, but didn't choose to do so. There are many owners who aren't concerned about the hotel, and many who are. This has caused some rather significant divisiveness among them. We love our home. Our neighbors are wonderful. We enjoy the city of St. George and all that the nearby area has to offer. It's such a shame that Sun River hasn't proved to be the relaxing retirement haven we were seeking. St. George is a great town and SunRiver is wonderful. We absolutely love living here. The amenities are fantastic. It's got everything you could need, the weather is fantastic and the people here are very nice. We feel like we've living in a vacation resort! We just recently moved to Sun River and cannot believe how wonderful it is - in all respects! The community is well-kept, lots of activities, beautiful views and everyone is exceptionally friendly. The homeowner fees actually include the maintenance of the yards so the neighborhood is just like new. The town of St. George has everything you would need and very good medical facilities. We moved here with only one visit because we were so impressed and we couldn't have made a wiser decision. 55places.com is not affiliated with the developer(s) or homeowners association of SunRiver St. George. The information you submit is distributed to a 55places.com Partner Agent, who is a licensed real estate agent. The information regarding SunRiver St. George has not been verified or approved by the developer or homeowners association. Please verify all information prior to purchasing. 55places.com is not responsible for any errors regarding the information displayed on this website.